Our goal is to guide your child along a path towards a life long love of art, learning, and an enhanced sense of confidence in their individual talents and abilities. Projects focus on understanding the elements of art through drawing, painting, collage and 3D work for all ages with an experienced K-12 art teacher. Classes have been cancelled indefinitely. Tuesdays Early Childhood: 3 to 5 year olds – 15:30-17:30 Starts September 1st. Wednesdays Elementary Art: 6 to 10 year olds – 12:00- 14:00 Starts September 2nd. Wednesdays Early Childhood: 3 to 5 year olds – 15:30-17:30 Starts September 2nd. 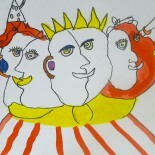 Thursdays Elementary Art: 6 to 10 year olds – 16:00-18:00 Starts September 3rd. September 12 & 19, October 10 & 17, November 14 & 21 and December 5th. Sessions are approximately 2 hours and include a homemade or fruit snack. My son loves her! She is a great art teacher 😉 Thank You Joy! I’m also commenting to make you urnedstand of the fine encounter my friend’s princess encountered viewing your web site. She even learned such a lot of pieces, including how it is like to possess a great teaching mood to have certain people with no trouble know some impossible things. You undoubtedly surpassed readers’ desires. Thanks for supplying such important, trusted, educational as well as unique thoughts on your topic to Emily. Thank you for your kind message Jin. I like to think of our art program as a labor of love!